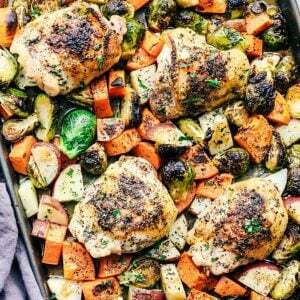 Sheet Pan Roasted Garlic Butter Herb Chicken is such a rustic and incredible dish. 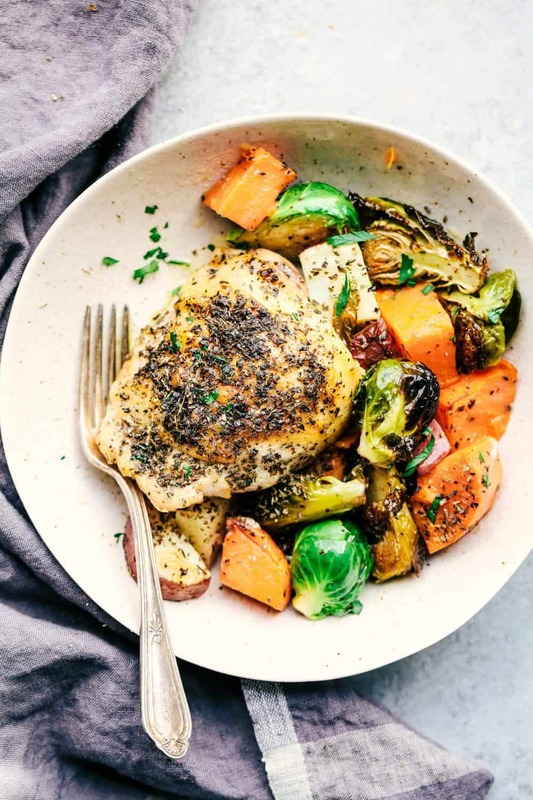 Surrounded by sweet potatoes and brussels sprouts this meal is loaded with amazing garlic butter herb flavor! I keep trying to make fall recipes in hope for the cooler weather to come. Geez. It’s September and it needs to start cooling down now. I love fall and I want to bust out the comfy sweaters and blankets. Fall is definitely my favorite season. And I do love that it brings slow cooker meals, sheet pan meals, and comfort foods. We can finally use our ovens again to make delicious creations. Sheet pan meals are my absolute fave. You only have dirty one pan and have your entire meal in one. This one turned out to be one of my favorites on the blog. But how can you go wrong with the garlic herb butter combo and tender and juicy chicken roasted to perfection!? I love how chicken and roasted veggies turned out. And I used some of my favorite fall vegetables. Brussels sprouts and sweet potatoes. I used my favorite herbs in this. Thyme, Oregano, and Basil. You guys. The smell of this cooking in the oven was incredible! All of the herbs and the buttery garlic goodness is incredible. As soon as it gets done, you broil the top to give the chicken and the veggies a slight crisp and brown them right up. I take mine a little over the broiling to give it a slight char. That char is my favorite! You don’t have to go quite that far with the end result but it sure is delish. Preheat oven to 400 degrees. 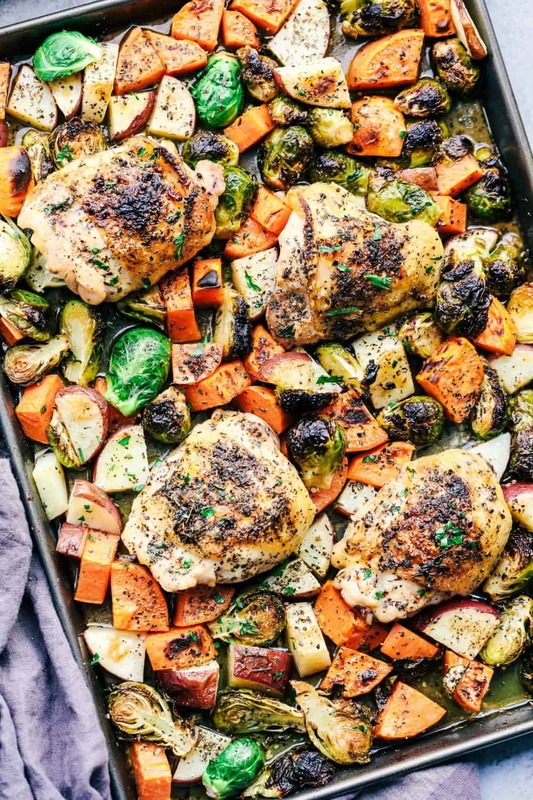 On a large sheet pan spread the sweet potatoes, red potatoes, and brussels sprouts onto the sheet pan. Lay the chicken on top. Season with salt and pepper with salt and pepper. In a small mix together thyme, oregano, basil, melted butter and garlic. Brush evenly over chicken and veggies evenly. Roast in the oven for 25-30 minutes until golden brown and cooked through. Broil for 2-3 minutes to caramelize the top of the chicken and veggies. hey girl- this looks amazing! have a great week! check the butter–do you mean 1/4 cup? 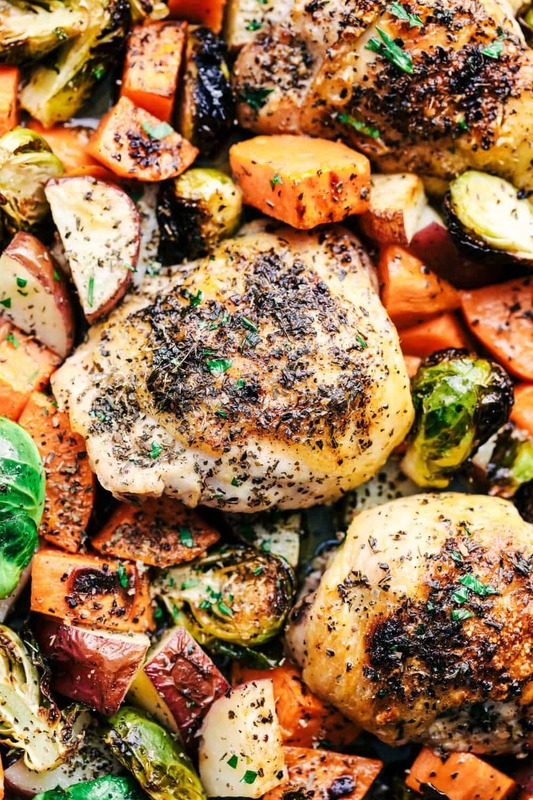 How much butter should go in your garlic butter herb sheet pan chicken. You don’t actually say. 1/4 of what. Thank you. Thank you for the recipe – can’t wait to try! Do you mean 1/4 cup butter? Thanks! Had to double the time in the oven for the chicken to cook thouroghly and at that point the veggies were still not done. Covered veggies in olive oil paprika garlic powder and threw back in oven for another 20 min after that. Going to make this to night, but with chicken legs and instead of the butter, I am going to try substituting olive oil instead of butter.